While I was making bags and softies and fun things I was also busy ploughing through a LOT of navy garments to get us back to school and uniform ready. As soon as we got back from holidays I attacked a 5m length of navy stretch drill and went all home sweat shop on it. Result: 4 skirts and 4 pairs of shorts for school uniforms. P still has school clothes that fit, so my contribution for him was limited to these two pair of shorts. Same size and basic pattern block as these cuffed ones I'd already made. Yep, too lazy to draft a different pattern. Also from a Japanese pattern book was this skirt. I t looks like the perfect school skirt pattern and I really like it, but sadly it's a bit too big. I chose the size (120cm) based on her measurements and it should have been spot on, but it's too long and a bit loose. It will be just right for next summer no doubt. So then I redeemed myself with a skirt that I am always delighted with. 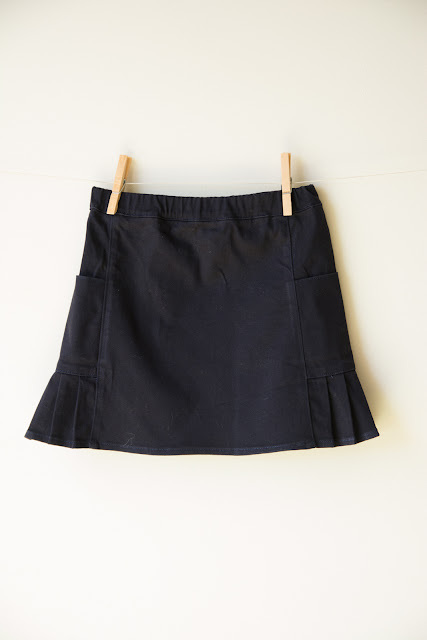 The Music Class skirt by Oliver + S.
Straight size 5 and it's perfect. Another skirt that I knew A would love, and which I haven't sewn for about two years is the Badminton Skort. 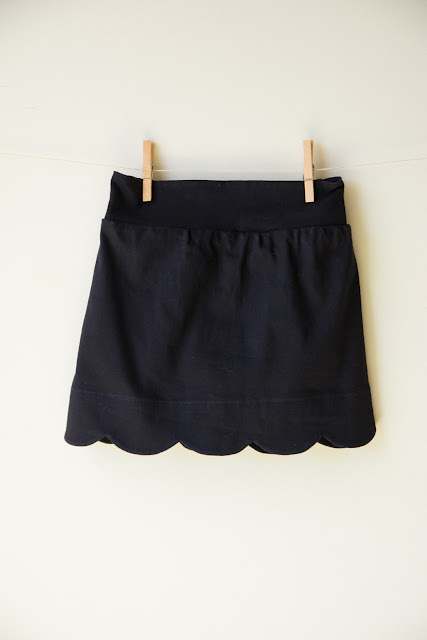 The school rule is plain navy, and while I thought about leaving off the scalloped hem, it's just too cute and so far there hasn't been any word that it's too fancy/frilly for school. Yay! Then I decided to bust out some as yet unused patterns. First up the Butterfly Skirt. 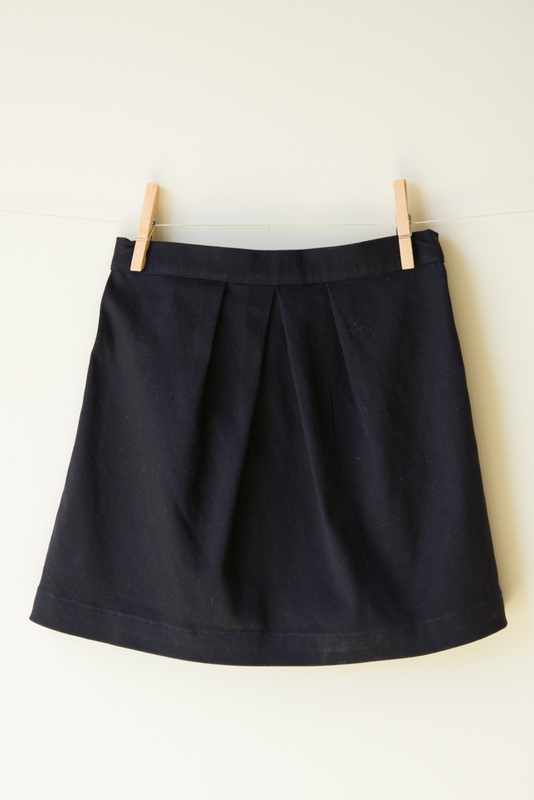 This is an incredibly quick skirt to sew, but it's perfectly stylish and is a very close approximation of the "official" school skirt. Again a size 5 for the win. This one will definitely stay on the school sewing list. Maybe with those Badminton shorts underneath? Here I mucked up. I'd been tracing so many patterns in preparation for the big sewathon and without noticing it I'd traced the size 10 waistband to go on my size 5 shorts. Both the front and back waistbands were mistakenly way too big. By the time it came to attaching the waistband it was about 3 inches too big. I made it fit (dumb dumb) but that resulted in an incredibly wavy, stretched out pair of shorts. There is no errata for the pattern and everyone else's shorts looked great, so I knew I'd botched it somehow. I unpicked it, chopped out a few inches from the centre front of the waistband, creating a seam where none should be. It was only after I'd finished that I checked my pattern pieces and realised my error. Oops. Anyway they look insanely cute on. Bit like 70's style gym shorts. I love the idea of a non-school pair in a floral sateen. 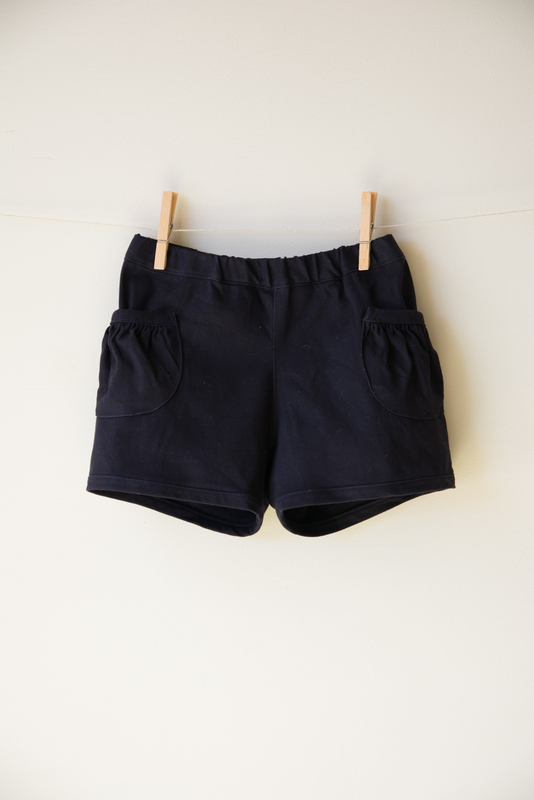 These are the Puppet Show shorts. One of the patterns from the first Oliver + S release, and one which only goes up to size 5. So these were sewn with a wistful, last time kind of feeling. My paper pattern envelope was marked as if it was the second printing, but I suspect I should have looked at the pattern sheet itself. The first printing contains an error such that the leg binding is too long and the shorts lack the cute gathers at the side hem/cuff. You can see mine are more straight leg than the intended curvy shape. Still, they also look incredibly cute on and I can see they will fit for a while, so perhaps I'll get to make a non school version for next spring after all. By choosing different patterns I kept myself amused enough. Just. Mostly I'm happy to say that I've created 8 garments for school from a $40 piece of fabric, and probably have enough leftover for one more simple skirt. Can't beat that for value! Wipe your sweaty brow and have a coldie! That's an impressive output. Cool that the style dosen't matter, just the colour. That sounds like a manageable uniform policy. I really like the butterfly skirt, such a lovely shape. 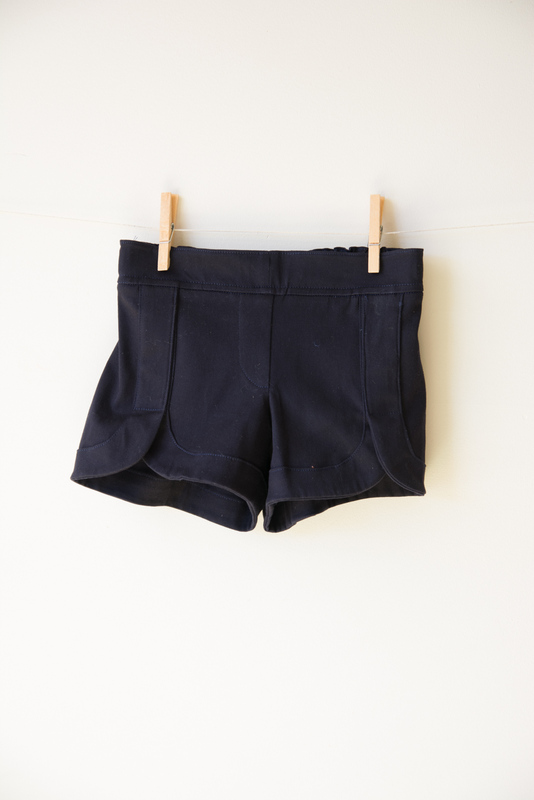 Clever idea to attach the shorts to the skirt waistband. I've seen cycling skirts for grown ups like that. Must get around to making one for me. I ride either in cycling bibknicks or regular clothes and have never felt the need for hybrid clothes, I'll be curious to hear if a skort is worth having for on the bike. Definitely for hanging upside-down on the monkey bars! I love the scallop and side pleated skirts!! That side pleated has always been a favorite yet I haven't made it!! 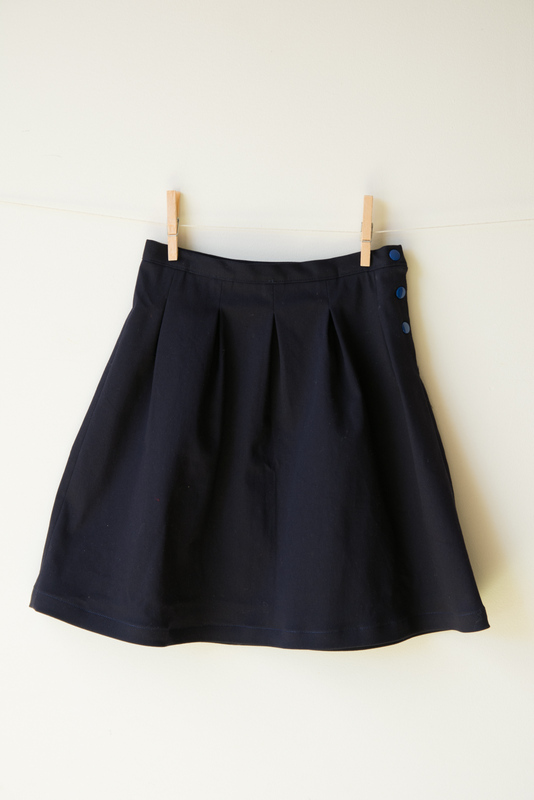 Have you made that Oliver +s skirt that buttons in the front? Can't think of the name. That would be cute too in the Navy. Thanks Jennifer, give the Music Class skirt a go, it's such a quick sew and is so pretty on bigger girls. I think you're thinking of the Hopscotch skirt. It's been almost three years since I last made that pattern, but yep, definitely needs to be on the list next round. You are incredibly prolific, as always! These are all such practical and good looking items! 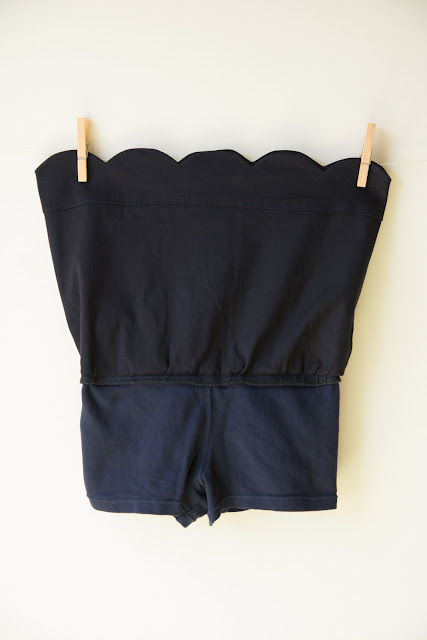 But I can't imagine sewing 8 navy cotton items in a row. KILL ME NOW. You are not only a great seamstress, you are persistent. You should get some kind of medal for this effort! Oh, you're right Inder. I am one stubborn finisher. I've read some astoundingly dull books yet still had to go to the very last page. If only I didn't start, hey. It was nice to mix it up with the bag and softie sewing. Cheers Marisa. I wish I could make the dresses too, cause you're right, they're costly, and not that well made. Sadly, it's a check that I just can't match to any fabric. All manufactured off shore in the one factory, from fabric to finished garment. Grrr. I might have to celebrate in some other way as I need to sew through the stash, not add to it! I fell foul of the hat rule once after P lost his official school hat for the nth time and I sent him in s bucket hat of the right colour. Yet it seems by the time you get down to the kids feet, anything goes! A few years in and I'm much more cavalier about the rules now! Good luck playing the game at your school! Nice, all from one cut of fabric! I suppose that at least makes the fabric shopping easier. I am starting to think about shorts up here in the northern hemisphere. But there is snow in the forecast so I think I probably can wait a little while. 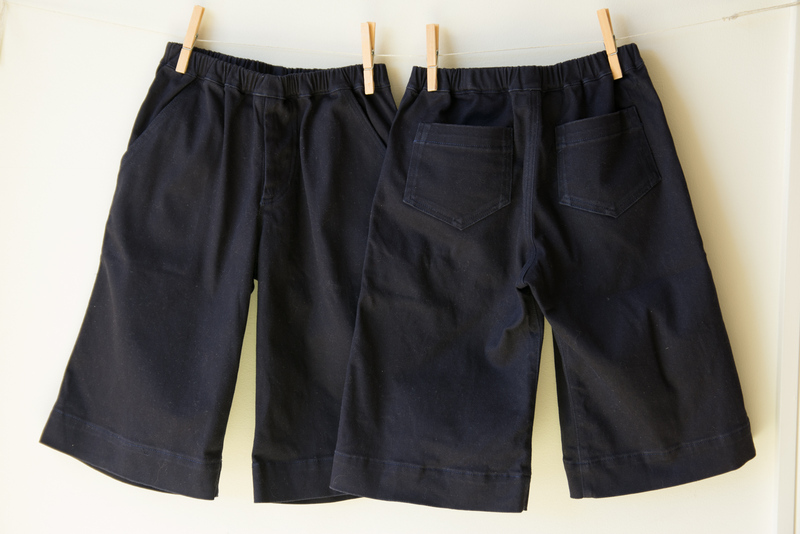 I'm looking forward to trying the oliver + s sketchbook shorts this year. Thanks Emily. It is handy to know that certain fabrics, like navy drill, will be useful for the next six years (aaargh) so I buy it when it's on sale somewhere. You'll love the Sketchbook shorts I'm sure. Snow always sounds like fun to those of us who don't get any! That is definitely not only sewing the fun stuff. Wow, the effort of tedium. Good idea breaking it up with a few different patterns. Seriously Shelley, when do you sleep? Or you work super fast. This is really impressive! Very inspirational again and I really love the badminton skort! The Badminton skort id such a cute pattern. It's a lovely shape when worn too. This was a solid weeks work and my version of Kid's Clothes Week - which is probably why I couldn't muster any enthusiasm for the real thing last week! There is something very satisfying about sewing your own uniform, but boy is it a hard slog at the time! Well done getting through it all. I am going to have to stock up on our standard uniform grey soon. Luckily I still have enough gingham left for summer dresses. I am hoping the Butterfly skirt will fit Boo as I want to try it soon (printed off this morning)! I love your school dresses Katy. I really hate not being able to get the dress fabric I need to match our uniform. You'll be amazed how quick the Butterfly skirt is, it's definitely a handy pattern for school wear. Oh just wish we could have worn cute skirts to school, small green gingham check was our summer uniform. It's nice that it's part uniform, and part dress code. I do wish the dress fabric was as simple as a small check, then I'd be all over sewing the dresses too!